I can t download apps from the Android Market. Your problem is not uncommon, Sharon,and there could be many reasons for your unsuccessful downloads. We will presume that you have not downgraded your Android phone to a lower model because that can cause problems with compatibility- not all Android apps support all phones,There is a series of steps you can try to get things working again and we will take them in order. First, cancel any downloads that you have started and restart your phone. 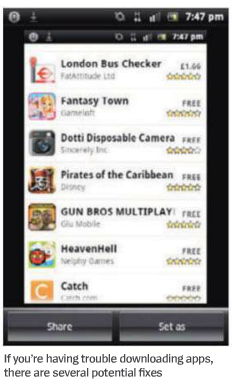 Now try to download some free apps to see if that is successful. 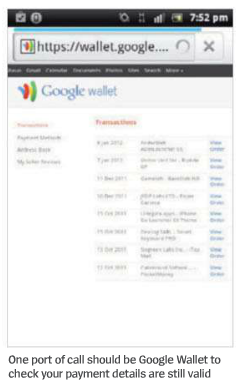 Next, you need to go to https://wallet.google.com/manage and check to ensure that your payment information is still valid. It does happen that when a credit card goes out of date. data and then Clear cache. Do the same with Download Manager. One of these steps should solve your problems and get you downloading apps again. There is one other thing to check which is signing in to Google Talk on your phone; if you can do this, there is no reason why you can't download apps from the Android Market. Label: I can t download apps from the Android Market.